The Burrton Skeleton Key is a board I’ve wanted to try since it came out but didn’t get to. But then Dan, a guy I met on the chair, let me try it so thanks, Dan! It was pretty much everything I was hoping it would be and it unseated the Branch Manager as a favorite. After riding this I went out and straight up bought one. Then I got to try the 2018 thanks to Gravity Sports at Mt Bachelor which is the same as the 2019 model. It really is a great way to surf powder and groomers. The 19 model is made in China instead of Vermont for the 17 and I think Austria as well for the 18 model so the price dropped from $749 in 2017 to $549 in 2018 to $499 in 2017. The 2018 and 2019 Burton Skeleton Key models are little more accommodating to a heavier build where the 2017 model had a lower recommended weight range. The 2019 model might have a -25mm or -50mm setback on sidecut. It seems to be almost exactly the same place as my 2017 model so not sure if the Burton site is right or what was printed on the board is right. Regardless the setback on board is almost exactly the same as well. The 2019 Burton Skeleton Key added 150 and a 162 to accommodate a wider variety of riders where the older models only came in 154 and 158. Still, it has all the same tech and same build as the 2018 so this review still stands. Conditions: About 2 feet of powder with some groomers on the way to the chairs, one day. A couple of other days about the same or better. Lot’s of good snow groomer days and a few spring days hard in the morning slowly transitioning to slush by early afternoon. Boots: Burton Almighty, Adidas Tactical ADV, Burton SLX, Burton Rover, Burton AMB, Adidas Samba. Liked the Genesis X and Atlas bindings best with this board. Liked the Tactical ADV and think the Imperials, SLX’s or Ions would be a great combo too. My Almighty’s were a touch soft. Set Up: about 12 front -12 back and about 22″ wide one day, many others we have ridden a bunch of different stance angles. at around 22″ from 15 front -3 back, 18 front -6 back, 21 front 0 back. We have set this all the way back and ridden it close to reference stance. Approximate Weight: Felt normal bordering on light. Sizing: The 154 felt like magic when it came to quick nimble turns in the trees compared to the 158 and I think I might prefer the 154. However, I liked the drive and more powerful feel when opening up on groomers. Its core is a little on the thin side and at the time I write this I’m 180lbs after a long steamy piss right when I wake up so per Burton I’m right at the 2018 limit of the weight recommendation. That being said I’m usually heavier than the weight recommendations and with the way I ride, I’ve never damaged a snowboard due to bad food choices. I’m kind of in between the 154 and 158. If there was a 156 I think it would be perfect for my boot size (most important, weight and height). Still, both are fun and it comes down to how you want to ride. Short and quick the 154. A little more drawn out and opened up on the groomers 158. Flex: Nice flex that feels pretty firm between the feet but it was pretty easy to butter the tail. The 158 feels a touch stiffer but that can vary from board to board. Maybe there was a little bump to the flex to handle a higher weight recommendation but I’m not sure. On Snow Feel: The Burton Skeleton Key got that same great stable feel that so many of the Family Tree tapered directional boards have. The more I ride it the more I feel it’s a more playful, directional, quicker turning and surfy version of the Flight Attendant. I wouldn’t have thought that it had 10 mm of taper. It is not wash proof but a lot less washy off the tail than you would think for this kind of taper. It’s a very off the tail kind of surfy ride that’s got a super quick lively feel underfoot. It’s just pure powder surfing fun. Edge Hold: It’s fine for anything but hard to icy snow. 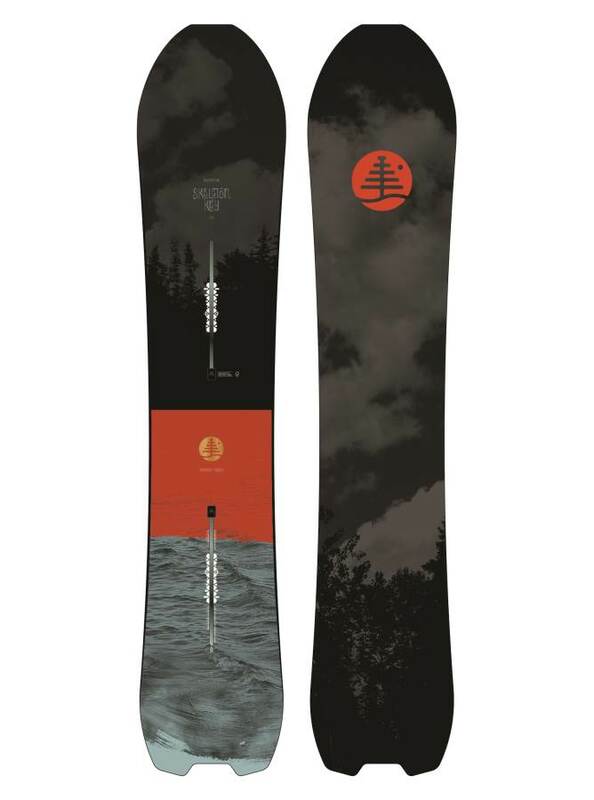 In comparing this to a lot of our other Snow Surf and Freeride favorites it’s a little behind when it comes to grip. When the snow is hard you really have to dial back your turning and the edges let go easier than most in this class. It’s an improvement over Burton’s Flat Top and Flying V camber but in our opinion, it needs a little more if you want to ride in the harder snow. Turn Initiation: So quick and snappy edge to edge. It’s like the Branch Manager and a real tree cheetah. It’s super quick in tight situations and I could react so quickly that it made me feel like I was a better tree rider. The board just went where you wanted it to go with minimal effort. With other boards, I could do the same line but often there is an awkward moment getting the board where you want it and I lose my poise but with the Skeleton Key, I felt like it was setting me up to be cooler than I am at every turn. Turning Experience: The overall turning experience from rolling it over from edge to edge quickly in the trees to making big sweeping carving turns is really fun. The Freeride Geometry sidecut is pretty interesting because on groomers it feels more like a double ender like the Flight Attendant does but in powder it feels pretty surfy like it should. It’s a fun board to turn and even though it’s super quick edge to edge it’s not a super tight turner when the sidecut is completely engaged. Still, you can make fun circle carves and enjoy your self every time you put your weight into a turn. It’s a great daily driver for those that only want directional surfy turns and mainly ride only when the snow is medium or softer. Skidded Turns: Not ideal but not as bad as camber. You really want to know the mechanics of turning otherwise you could catch an edge on the tail if you get off your game. Still its pretty forgiving for having this much camber going on. Carving: Nice springy surfy carve with the Burton Skeleton Key. I could really lay it out as long as I put a little more weight on the back foot. Speed: It could handle some decent speed but it’s not quite a bomber. I rode the Burton Flight Attendant after and I could feel that offer up a much more damp ride. Uneven Terrain: Just about perfect and I could hammer turns in moguls all day. The only minor complaint is it’s a little bucky if you try to power over bumps instead of around them. Powder: The Burton Skeleton Key does a really good job for a 154. We have had up to a few feet of pretty decent Sierra and Cascade snow with the 154 and it floats really easy. Not sure how effortless it will be in 3 feet plus of powder but I think it shouldn’t struggle too hard to stay afloat. It’s the board I want to take out when it’s a powder day but not bottomless and just jam through the trees. We liked the 154 Burton Skeleton Key better than the 155 Branch Manager across the board on a head to head test….except for riding switch. When set all the way back on a 21.75″ stance the 2019 Burton Skeleton Key has a 10.75″ setback on board but we are measuring from inside the almost 1″ notch so you could call it almost a 9.75″ to 10″ setback on board as well. Regardless this is a ton more than the -25mm back on sidecut that it says on my board or the -50mm back it says on Burton’s specs online for the 2019 and past models. I’m not sure if I should believe the board or Burton’s site. Based on my 2017 model having almost the same setback on board and sidecut as the 2019 model, I think I’m going to believe the site’s specs. Regardless that’s a lot more than the Flight Attendant and this board rides a lot further back on the tail than most Burton boards. Also, the nose and waist are pretty wide for this size so that helps too. So does the rocker in the nose and the taper in the tail. It turns small and floats big for its size. That get’s my pants tight and makes for a fun but sometimes awkward ride if I don’t tuck correctly. Pipe: Maybe to slash the walls on a softer day. Jumps: Really good spring off the tail and it boosted me higher than I thought each time I hit a little natural feature. Really great for a directional air and much more pop than you would expect for such a thin board. So the more I ride the Skeleton Key the more I like it. We try to get as many images of the Burton Skeleton Key, but forgive us if they're not all there. Took my new skeleton key out for its maiden run the other day and was not dissapointed in the slightest. Really fun board to use. Able to turn on a dime and bomb down runs with ease. Great on groomers and deeper untouched snow. Absolutely screamed my heart out as a result of the joy i felt from riding this board. Absolutely love it! Taken it out 8 times including a 2 foot powder day in Mammoth and I blew by almost everybody in the deep semi-heavy pow. Zero strain on my back leg and easy to turn without skipping a beat. Super stable in bumps & tracked out snow. Agile in the trees and fun to cruise on groomers. I have the 158. My first day on this board was on a icy east coast day. I was charging 60 km/h with ice and had a solid edge hold. The carving capabilities are insane! I can really lay out turns. For quick carves it does very well too. It does everything. Even brought this to the park. Jibbing feels catchy. Jumps feels solid. This is a all mountain killer. This board rocks. I was shocked at how much fun it was. I have the 158CM. I am 55 years old and have been riding since 1990. Mainly a freerider but needed a board for having fun riding with less skilled friends or my skier wife, but could still charge when I could ditch them for a few laps and didn't want to change boards. If I only had One board I had to choose for fresh powder resort slaying this would be it. Stable enough to charge, fun enough to hit everything (except park/pipe). Floats well enough in 1-2 feet of fresh. Plenty fast and VERY agile. I demoed this against the Jones Hovercraft and it was a better fit for my riding style. Jones is solid but less agile and "heavier" underfoot. Also tried the Panhandler but that was not versatile enough. I also own a Nidecker Ultralight 160 which is my go-to All Mountain freeride board and heli/cat so the skeleton key is a great option for the surfy fun board. I have not tried it for bigger mountain freeride yet but did not buy it for that. I recently took this board to Japan and absolutely loved it. This is my first really directional board and im never looking back. Great fun in pow and loves to carve/play around on groomers. BUT... after one week of riding the board had bowed! My bindings started rocking heel to toe, and the base now has around a 3-5mm concave. I would give a 5 star review depending on how my LBS and Burton handle this. Bought this board due to hype and wanting a board for powder. On groomers this locks in nice and has a good spring in the turn. Seems to hold a edge well too. Took it out in a metre of light pow in nz club fields. Excellent float and really does surf well. My only complaint is it is slightly on the heavy side and I feel maybe should have got the 154. Any way great deck made at Craig’s Vermont which is nice. Cheers to the boys at goodride. Next purchase skipjack 2018 hakuba 2018! I have the 154. Good god is this board fun! Effortless float, quick turns in the trees, stable opening up in the steeps, carves a hard edge on groomers, and is still fairly snappy for a powder board. It's butter-able if you're trying to get silly, though a bit catchy for tweaked-out presses (this is really the wrong board for that kinda thing). It's a little slow edge-to-edge on groomers, but nothing bad — just not as quick/effortless as the Parkitect I usually ride. In powder and chop, it's perfect. I have never yelled with joy so much! Note: I pushed the recommended weight range considerably, and still get tons of float — I've gone from a dead back leg after half a day in the deep stuff to riding open to close and still having energy left, and that's with close to reference stance! Pushing the weight range also probably makes flexing the board easier, which I prefer anyway. I have used this board 10+ days in pretty much all condition besides big spring crystals and slush. The SK is awesome!!! It carves really well on groomers and even icy conditions and excels in the pow and trees. Even has a bit of surfy / slashy feel to it to get that end of day snow on the side of the runs. It is a mid wide making perfect for my size 10 boots (I don’t catch my toes compared to my others boards: custom twin FV, mod fish, T6) but affects slightly the edge to edge transition speed. Well worth that compromise. Compared to the Landlord 163, the SK has significantly more torsional flex, making it more \"surfy\" and better for tree riding. In the used up pow, the SK seems to just plow through it. Really stable board. Snap on the tail is good for its size. This board is for powder/trees and directional fun on the piste hitting rollers and the occasional jump. If you can find one, get it! Or wait till next year when it will be in the regular line-up.